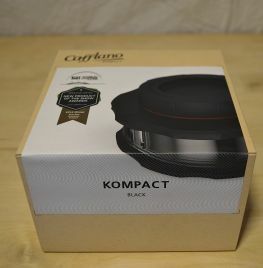 The Cafflano Kompact has a name which gives away an obvious feature. It's small. You can basically fit it in your pocket (OK maybe a large pocket). In fact, it packs away small - but expands out to make the coffee. But it's also an award winning coffee maker, so no concerns that quality is sacrificed for scale. The Cafflano Kompact is a press type immersion coffee maker. an easy creation of high pressure using the pump mechanism. can be used for hot brew, or cold brew with the airlock cap.